So my second week of training for the Race for Life has been non existant – I managed to catch Louise’s lurgy last weekend and have been feeling very sorry for myself! Hopefully with the clocks changing today, I will be more likely to go running after work, because it will be lighter longer. My running pack arrived this week though, which is pretty quick. My number thing is lower than I thought – I would have expected more people to have signed up by now! 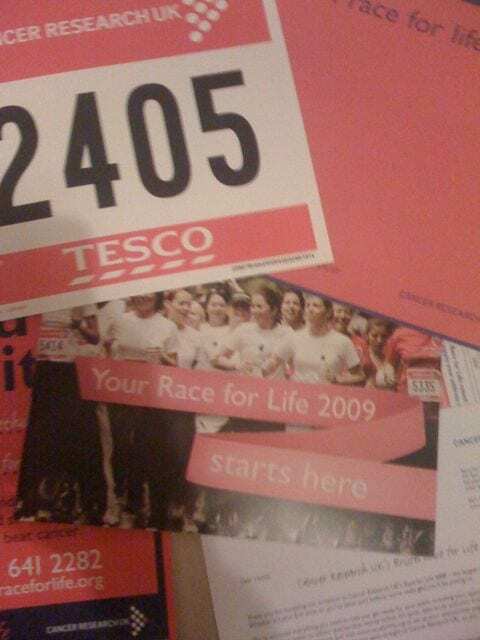 The pink sheet is the back sign, which you need to decorate with the reason why you are doing the Race for Life. I want to make mine look awesome this year, but I can’t think what to do!